My mom passed away almost 11 years ago on March 15th, just 16 days before her 50th birthday. She had breast cancer. I was 22 at the time, the oldest of her four kids. So, obviously, she's no longer around to give motherly advice. Sometimes I think that's why Jenny and I rely so much on each other. We each fill that mom roll to the other. Weird. I know. But, it seems to work. We just take turns, depending on who needs to be the kid most at the time. Our mom doesn't answer the phone when I call and she can't come over for dinner. We can't talk about how I was as a child or the similarities between me and Joey. 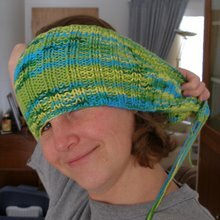 Until recently, I also happened to believe that she was no longer available for craft projects. I was wrong. Because she did manage to make an Easter dress. 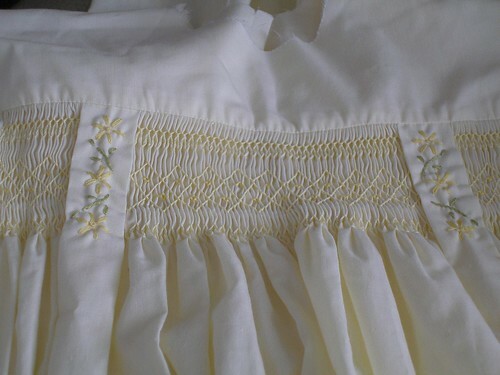 Thanks to the fact that my mom had as many unfinished projects as I do, I recently discovered an almost entirely completed, yellow, smocked dress. I have no idea who she started it for, but I know that it now belongs to Joey. Looking at this makes me feel at peace. It makes me cry, but they're happy tears. When I look at this, I don't feel angry or bitter that she's gone. I feel like she's right here with me. I feel like an adult and a kid, a mother and a child... all in the same instant. And I know that everything is OK.
That is a beautiful dress and I'm so happy you have it. My mom died less than 3 years ago, and I have an unfinished doll nightgown that she started, but I'm not ready to finish it yet. I like knowing that I have it, though. What a beautiful post, Wendy. How precious that dress must be to you now. What a special Easter outfit for Joey. I'm sure she will cherish it into her adulthood. I always feel my Grannee with me when I make bread, but there's her presence is even more pronounced when I come across something that I know has been in her hands. Particularly to see her handwriting or hold an object I know she used regularly. I'm glad you have your sister to trade off being the mom. What a lovely and sweet way to keep your mother's memory with you. That post made me cry! That's beautiful, Wendy. I'm so glad you've found a way to connect with your mom after she's been gone for 11 years. And I'm so happy for you that you have a sister to help stand in for mom. Family is so important. Thank you for reminding us of that fact. I love that it makes you feel at peace. Amazing that she made that and that it will now be worn! I'm so proud of you for finishing that dress. And thank you for being my sister. I love you. Oh, I am so thankful you sent me this. Fundamentally I know everything is going to be okay, but to read your words and hear the grace in them is very comforting. Thank you!